I got up early this morning to make sure I'd be ready and not rushed. I had my shower, did my make-up, got dressed, ate breakfast and had a cup of tea, all before waking up the kids. 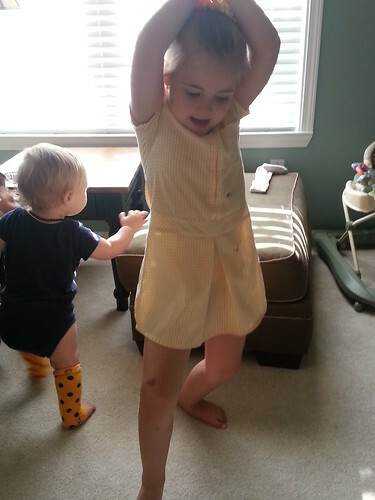 They woke up excited and cheerful, and got ready faster than I've ever seen them do before. They ate their breakfast, got dressed, brushed their teeth and even made their beds without being asked. We were all ready to go with about 45 minutes to spare. We only live a couple of blocks away from the school, so we put Jaguar in the stroller, Gracie on her leash, and we walked down to school. All along the way, we passed kids from our neighbourhood standing at the end of their driveways, presumably waiting for their bus. 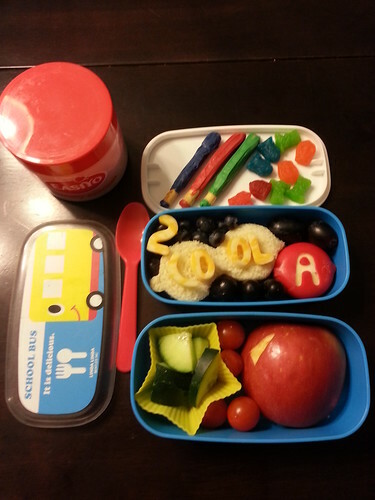 I saw kids in their cars from our neighbourhood driving to school. Seriously? Can't Americans even walk the length of themselves? There is even a sidewalk (which is unusual) on the road leading up to the school, but we were the only people I saw using it. Then when we got to the school, there was no safe place for kids to walk up to the building without cutting across the bus line! Crazy, seriously. Anyway, Fifi went in without a single worry. She kissed her brother and sister goodbye, patted Gracie and gave me a kiss and a 'Tha gaol agam ort', and she was away into the building. My big grown up girl. 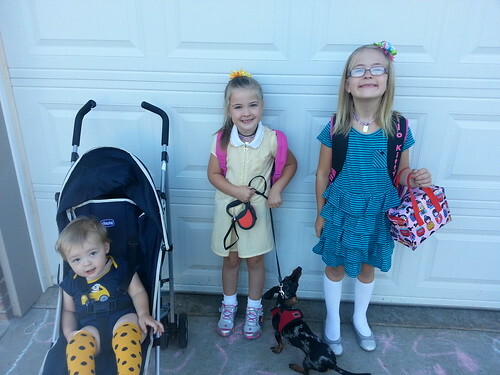 Lolly, Jaguar, Gracie and I walked back home to start Lolly's first day of school. Originally we intended to send Lolly to pre-kindergarten but the cost was just more than we could justify, so we decided to homeschool her in preparation for kindergarten next year. She has been so excited about this. I am actually going to do a prepared homeschool program called HIPPY (Home Instruction Preschool Preparation for Youngsters, or something like that) with her, but it hasn't started yet, so until it starts, we are doing our own thing. 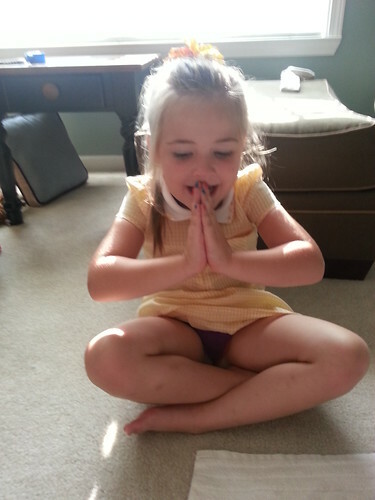 Each day will start with a bit of yoga to get my wild child focused. We then looked at pictures of different foods and identified them. Lolly thought that was great fun. 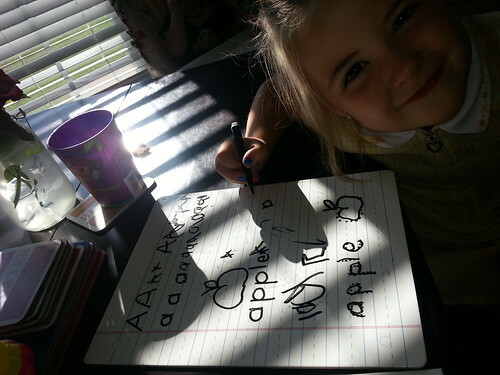 Afterwards, we had a snack of A-A-Apples and practised writing her letter A's. Following that we did a bit of big-and-small, tall-and-short work, by which time she was getting very Lolly and tired of work. I let her draw pictures of Tinkerbell for a while, then put on a Tinkerbell DVD for her while I fed Jaguar and tried (unsuccessfully) to put him down for a nap. After the DVD we will get into the kitchen together, get dinner started for tonight and have our lunch. After lunch, we'll read some books and go play outside. It doesn't sound like much, but it IS just pre-school. And it's fun. It's low-key. It's very Lolly. Then later this afternoon, we'll be that weird family again who walks to school to pick up our kids. I can't wait to see Fifi again and hear how her first day went!